I have been asked by several people what pattern I used to make the bears. Here it is: I bought it at a thrift store for fifty cents; it looks to be from the 1980's. By Great American Quilt Factory, Inc. There are three on ebay right now for about 5 - 13 dollars, counting shipping. 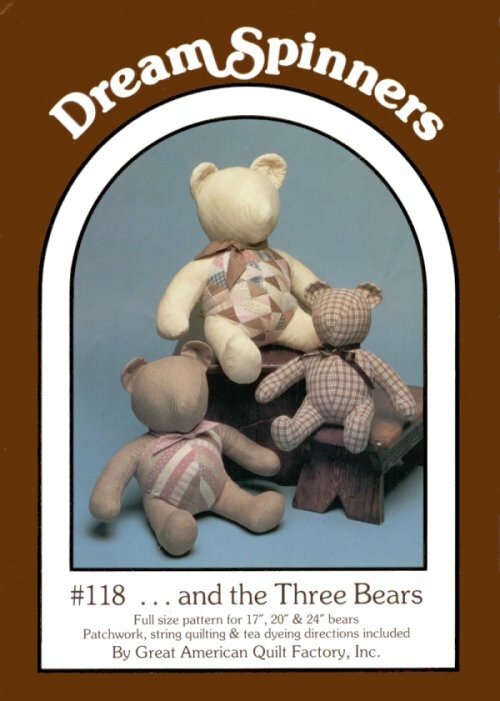 Obviously, I added faces and such to the faceless bears in the pattern, and I didn't use the fabrics they used. But then, I never follow a pattern 100% because there is no fun in that. This is a good pattern and the pieces are a good size, making them easy to use. Looking at the picture on the package, I would have never purchased it in a store because it just didn't interest me. I originally purchased it because it was in a bag that had lots of taffeta pieces in it that I thought I could use for a crazy quilt. That never happened; I ended up using some of those pieces in these bears (pink, blue, and cream for the ears and paws). So, I ended up actually using the fabric for what the original owner intended: a fabric bear, not a quilt. I only remembered this pattern when my children started talking about the bears. I think I have had it for 5 years, just sitting in a box not knowing what to do with it; but I saw that the pattern had potential. Hi there- I'm trying to sew these bears and I'm not awfully familiar with patterns and I'm trying to find help on what seams I need to connect the front and back body pieces of the bears? if you could help me it would be greatly appreciated.